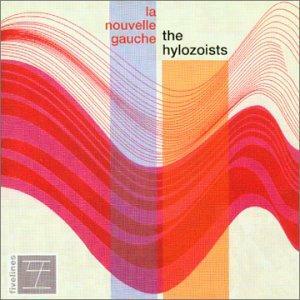 The Hylozoists - "La Nouvelle Gauche"
When I think of music from Nova Scotia, I think of rollicking Celtic bands with fiddles, singing songs about the salt of the earth people of the Maritimes. So it came as a bit of a surprise listening to the otherworldly pop experimentalism of the Halifax based group, The Hylozoists. There is nothing remotely Celtic about this music. Taking their cue from post rock bands like Tortoise and Stereolab, The Hylozoists go a step further, synthesizing numerous pop influences into a wild and woolly psychedelic morass. Amidst jingling vibraphones, prancing harpsichords, space age sound effects, jubilant strings, and sighing theremins, sunshine pop Pet Sounds melodies collide head on with looping, twanging slide guitars, like Hank Snow stuck with the Beach Boys on a Ferris wheel at a seaside amusement park. Over the course of the 10 songs on their debut album, The Hylozoists take you on twists and turns through a vast kaleidoscope of sound, with strange, lilting melodies that never seem to go in any direction you expect them to. Whilst no single track stands out from any of the others, the album works very nicely as a whole, a complete, instrumental, psychedelic journey through the history of pop music, seen through the compound eyes of extra-dimensional aliens. Visit the Hylozoists at their web site: http://www.hylozoists.com. Visit the Brobdingnagian Records web site: http://www.brobdingnagian.com.